On December 6th, 2018, the National Day of Remembrance and Action on Violence against Women, West Coast LEAF released their 10th annual CEDAW Report Card, grading BC on nine issues impacting women’s human rights, including child protection, a new section introduced this year. 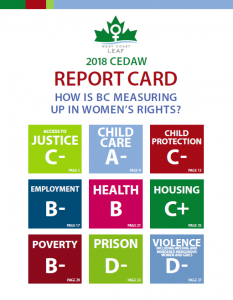 The Report Card assesses BC’s record in 2018 in relation to obligations set out in the UN Convention on the Elimination of All Forms of Discrimination against Women (CEDAW). Although this year’s grades have improved in most areas, BC continues to fall short of CEDAW’s requirements. While BC’s historic investments in child care this year have advanced women’s economic security and equality, its failure to address human rights violations in the prison system and high rates of gender-based violence, particularly against Indigenous women and girls, leaves lives in jeopardy. To create a society where women have a meaningful chance to seek greater safety, BC must ensure access to the resources they need to survive and thrive, including legal help, housing, health care, financial supports, and culturally appropriate anti-violence programming and healing opportunities.